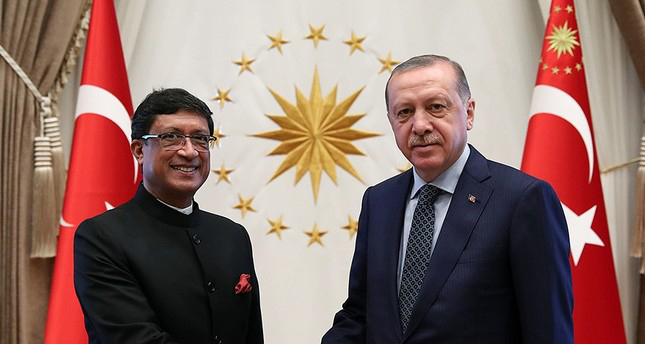 President Recep Tayyip Erdoğan is pictured with Indian Ambassador to Turkey Sanjay Bhattacharyya. Since the establishment of bilateral relations between Turkey and India in 1947, the two nations have been enjoying warm and friendly ties. Following the Indian declaration of independence on Aug. 15, 2017, the political links between the two countries have steadily grown year by year. With commitment to deepening and strengthening bilateral trade, investment and relations, both sides have accordingly increased the frequency of high-level visits in recent years. India, with a population well above 1 billion, is one of the most crowded countries, most established civilizations and largest economies in the world. It naturally dominates the Indian Ocean, a transition sphere between the Arab, Asian and Malay worlds. India's relations with Turkey have deep roots in history, memory, culture, language and society. The political relations can be traced back to different phases in past centuries, such as the Ottoman caliphs and sultans who had direct links with their Indian counterparts. However, the already strong ties have been further refined into a fine art in recent years. 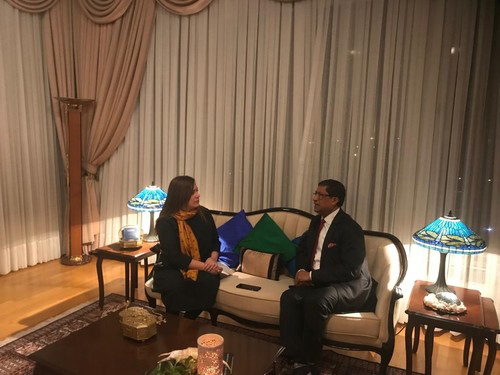 The Indian Ambassador to Turkey Sanjay Bhattacharyya answered Daily Sabah's questions on these relations, friendship and cooperation between Ankara and New Delhi. Emphasizing that the bilateral ties between Turkey and India are consist of three principal pillars which are political-security cooperation, economic and scientific engagement, cultural exchanges and person-to-person contacts, Bhattacharyya said a new momentum has been fueled by high-level meetings between President Recep Tayyip Erdoğan and Indian Prime Minister Narendra Modi. Bhattacharyya assumed charge as the ambassador of India in Turkey in June 2018. After presenting his credentials to Erdoğan, he praised the developing ties between Turkey and India and conveyed his interest in increasing the cooperation between two countries in terms of politics, the military and the economy. "Our leadership has identified an agenda to further deepen and expand bilateral corporation to its true potential. I intend to work closely with the Turkish side to implement this objective through concrete steps, and timely implementation," Bhattacharyya said. Turkey and India have shared the same values including democracy and pluralism for a long time, however Bhattacharyya stressed that both sides also emphasize the importance of developing economic cooperation on a mutual basis. Tourism, civil aviation, and commerce are particularly key elements to intensify economic ties. Several bilateral agreements and institutional mechanisms, at the governmental level as well as in business-to-business (B2B) sphere, provide the framework for strengthening economic and commercial ties. Bilateral trade stood at $6.4 billion in 2016. However, regarding the population and the sizes of the economies, Bhattacharyya stressed that with growing economic development and Indian strategic outreach, the potential for the two nations is even greater. As the tourism sector is an area that fosters cooperation between India and Turkey, Bhattacharyya said that it requires closer coordination between the travel agents of both sides. He added that the two tourism ministers are expected to hold a meeting before the end of the year. Attending the India-Turkey Business Summit in May 2017, Erdoğan reiterated that tour operators should be encouraged by giving weight to the promotion of travel. The president recalled that there has been a significant increase in the number of Indian families who have organized weddings in Turkey. Sharing his opinion about why Indians prefer Turkey as an ideal destination for their weddings, Bhattacharyya said that it is because of the friendliness of the Turkish people. He added that it provides a good opportunity for a new and different experience which people would remember. "Destination weddings have become very popular. Many Indians, particularly very rich Indians, are making Turkey the venue for destination weddings. So, last year mostly in the Mediterranean coast, Antalya is the most favored destination but some have been in Bodrum as well and now I think Istanbul is also trying to attract people for weddings. What the destination wedding does is that Indians love big weddings, like Turkey," Bhattacharyya added. In a statement to Anadolu Agency (AA), the event's organizer TravelShop Turkey & Murtis Tour General Manager Murtaza Kalender said the budget that the Indians allocate for weddings ranges from $750,000 to $1 million. Bhattacharyya pointed out that there is a 100 percent increase in Indian tourists overall coming to Turkey and they would like to have similar increase in Turkish tourists going to India to meet each other, exchange notes and actually get much closer. Referring to the importance of improving transportation to help increase the number of tourists, Bhattacharyya said there is an air services agreement which is currently operating between Istanbul and two Indian cities; Delhi and Mumbai. Bhattacharyya also stressed that an Indian airline has expressed interest in flying to Turkey as there is an expansion of capacity in the Turkey-India sector. "Turkish Airlines (THY) and Atlasjet Airlines want to increase the number of flights and destinations to India. It will be on point to develop cooperation between Air India, THY and other aviation companies in which common flight arrangements are in place," Erdoğan also said during his visit to India last year. Enhanced economic ties are also based upon the bilateral cooperation mechanisms including the India-Turkey Joint Committee on Economic and Technical Cooperation (JCETC) and India-Turkey Joint Business Council (JBC) between the Federation of Indian Chambers of Commerce and Industry (FICCI) and Foreign Economic Relations Board of Turkey (DEIK). Even though there is no free trade agreement (FTA) between Turkey and India, the country has the opportunity to benefit from discounted tariffs on certain products for export to Turkey by making use of the Generalized Preferences System (GSP) applied by the European Union. "I strongly welcome the Turkish initiative to strengthen and deepen bilateral economic engagement. My government supports this objective and wishes to work together toward shared objectives. Our economic ties are healthy, however they are short of the true potential. On trade, we need to ensure sustained growth and product diversification. This can be possible if we work toward an FTA, which is mutually beneficial and provides leverage in home and foreign markets, where we have preferential access," Bhattacharyya added. Around 150 Indian companies have entered the Turkish market in the form of joint ventures, trade and representative offices. Notable among them are Polyplex and TATA Motors. Similarly, Turkish companies are represented in India especially in the infrastructure and construction sectors, rendering Turkey as the 41st overall in terms of foreign direct investment (FDI) inflows to India. "On investments, the potential is even greater. Companies on both sides can take advantage of global supply chains and market entry agreements to establish new manufacturing or service centers in each other's countries. Infrastructure, textiles, automotive, pharmaceuticals, IT, space and other high technology are among the areas where two-way investments would be mutually beneficial," Bhattacharyya underscored. As oil has been the world's major commercial resource for many decades, Ankara and New Delhi's main import items are based on petroleum and petroleum products. Iran, therefore, stood at the top of Turkey's crude oil suppliers, providing about half of the country's oil demand, while Iran is also a major and strategic source of supply to meet India's demand for energy. Eight countries including Turkey and India are exempted from the sanctions against Iran, allowing them to temporarily continue buying Iranian oil. Evaluating the situation, Bhattacharyya pointed out that sanctions, especially those without a U.N. mandate, do not attain the stated objectives. "Developing countries have special needs, particularly when it comes to our energy requirements, and this has to be given due consideration. Our relations with Iran are long-standing and based on close cooperation in our development aspirations, in which oil supplies play an important role," Bhattacharyya highlighted. Apart from the economic ties, the two nations are both willing to expand military cooperation and deepen ties in the defense industry. As Turkey has been diversifying its options regarding military cooperation and the defense industry with several major regional and world powers, India signed a S-400 air defense systems deal with Russia. In fact, the two countries discussed alternatives to payments in dollars, as reportedly a rupee-ruble mechanism was already discussed. Turkey, therefore, seeks alternatives rather than using the dollar for its purchases. Answering a question about any initiatives regarding the Turkish lira-rupee model to be used in trade between Ankara and New Delhi, Bhattacharyya said it will be their priority to expand their trade relations. "Accordingly, we would be happy to discuss all modalities toward this end, including the currency of trade, tariffs, non-tariff barriers, et cetera, for a sustainable model," Bhattacharyya said. Bhattacharyya said that Turkey and India must play a greater role in regional and global affairs to fight cross-border terrorism, promote development and work together to build a new global order. To further address a broad range of issues from humanitarian crises to international security, Ankara suggested in July the inclusion of Turkey into the BRICS bloc, which is an acronym coined for the association of the world's five fastest-growing emerging markets - Brazil, Russia, India, China and South Africa - in the annual summit of the organization convened in South Africa. As the summit provided significant opportunity for all member countries to develop better economic and political ties with Ankara, Bhattacharyya evaluated Turkey's suggestion, saying that Turkey can play an important role in the movement. "The BRICS grouping is an outcome of the changing geopolitical and economic realities in recent decades. The BRICS group promotes cooperation on a range of issues and includes projects that are implemented even beyond the member countries. It would be useful to include those like-minded countries which can contribute to the objectives of the grouping. The participation of Turkey in the Johannesburg summit, as the representative of the OIC [Organisation of Islamic Cooperation], provided an opportunity for closer participation between partners," Bhattacharyya said.